Banh Mi is a Vietnamese street sandwich sweeping the Internet, kind of like the recent bacon craze. With all this hub-bub, I did my research and found out that it has some (all?) of my favorite ingredients like pork, cilantro, jalapeno, crusty bread and pickles. Now I needed to try it and join the fray. I was discussing Banh Mi with one of my foodie colleagues at lunchtime and he found a local spot to try. Mind you this isn’t one of the high-falutin fancy joints you read about, just some quick takeout in midtown. It turns out that Banh Mi doesn’t have to be pork so I upped the ante and went for crispy duck while my colleague went for the roasted pork belly. Wow, this thing rocked! I can’t imagine how good it must be at the “great places”. The combination of savory meats, sweet and sour pickles and that soapy cilantro taste was awesome, but it looked and tasted complicated. I couldn’t make this at home, could I? I happened to have a copy of Bon Appetit proclaiming “5 amazing meatball recipes”, no wait it was “5 AMAZING meatball recipes”. Really now? AMAZING? I love meatballs, but this kind of enthusiasm seemed a little over the top. 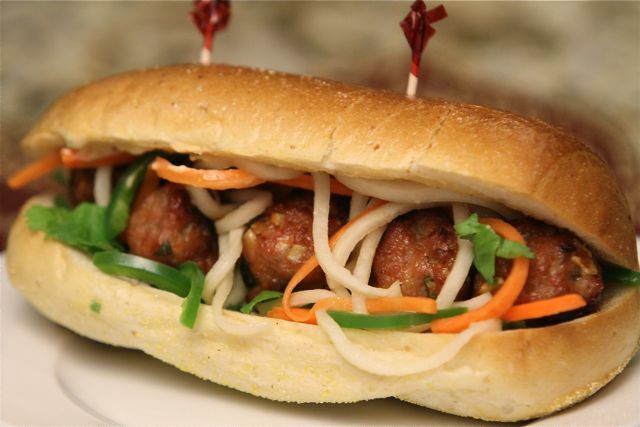 Serendipitously one of the recipes was a pork meatball Banh Mi, so it was filed for future use. I enjoy introducing Nicole to new things and since she isn’t in NYC for lunch often, I decided to break out this “AMAZING” recipe. I thought the sandwich came out very good, but not nearly as good as the crispy duck or roasted pork. To be fair it would be really hard for a pork meatball to match the depth of flavor as a nice slow roasted piece of pork. Nicole’s reaction was “it’s alright”. Blasphemy, but I still love her. I would definitely make this recipe again, but what was a real surprise winner were the accoutrements: sriracha mayo (used subsequently on a roasted cod sandwich), and pickled carrots and daikons. PS: I made 2 mistakes, one which is visible (which is why I am admitting it!) I didn’t have enough cilantro, so only a few leaves made it on, and I somehow mixed the sesame oil in with the pickling liquid instead of using it to bake the meatballs. These amateurish flubs likely impacted the taste, so I’ll need to give it another go one day. The photo is pretty crappy, we were hungry and I rushed the pictures. Recipe courtesy of Bon Appetit (January 2010). When ready, saute the meatballs in the sesame oil until browned on all sides. Depending on the size of your frying pan, you may need to do it in batches. I actually don’t like to fry meatballs so I baked them at 425. I also rolled ’em around a bit every few minutes to evenly brown them. I should have sprinkled a little sesame oil onto them first, but alas I mixed the oil in with the pickles by accident. Mix sriracha, scallions and mayo in a small bowl. Make sure you keep any leftover sriracha mayo. This stuff rocks. BUN ME! Honestly, I’ve heard of this, but that is it… I have to ask around. Street food is non-existent here, as I have said, but we have incredible independent restaurants here…so I will tweet out and find where I can indulge to understand the taste. I sounds really delicious. My favourite ingredients, too. This post was hilarious! Loved the read. I have been pushing them out to finish up the sous vide work (phenomenal experience, basic writing), and to get all others on the back burner out before we leave for the holidays. This is a recipe I will make, Andy! Hopefully sooner than I did the meatballs! And in August, I will do a two year reflection and list my favourite posts. Time for another one of those. I am glad that I can pronounce the sandwich name-obviously, I have not been saying it right. “Bun me’ I can say and remember. The sandwich looks great. I know that I would enjoy it. I have not had the pleasure of finding one here in Tallahassee. I wish I would have read your post while in NYC this past week, I would have made a point of finding one of these sandwiches. Happy 4th to you and your family. I guess I need to pay Velva for that “finder’s fee” after all… Just after I completely geeked out over your Bloody Manny post over on her site, I came over here and I saw the Pig post AND now this??!! Be still, my heart! There is a Banh Mi joing/stand under the metra station in Chicago. I started to love coming in to work downtown ever since it’s open. They have one with duck the orange. (Yeah, I don’t speak French so why pretend…) It’s 9 am. I am now starving. I also sounded completely drunk. What are you and Velva doing to me??!! Wow, orange duck banh mi…Now that sounds good right about now!